NFL Week 5 Fantasy WR Breakdown: Will Julio Jones Finally Score a Touchdown? Through four weeks, we are on pace for a record-breaking NFL season with a current average of 24.0 points per game per team. The fantasy gawds continue to shine their light upon us, gifting us a 12-game main slate that kicks off on Sunday, Oct. 7 at 1 p.m. ET. Even so, there are four games on the slate with over/unders in excess of 50 points. Five teams have implied totals of at least 27 points. Plus, it’s always a good time to play some daily fantasy football. In writing this piece, I’ve relied primarily on the FantasyLabs Models. This breakdown is less of a comprehensive analysis of each wide receiver and more of an introduction to this week’s players via our large suite of analytic DFS Tools. We’ll start with two high-priced wide receivers, follow with four pass catchers at the top of our individual Pro Models and finish with the rest of the field’s fantasy-relevant receivers. Two wide receivers form a tier at the top of the positional salary scale on DraftKings and FanDuel this week. Brown is having something of a mixed campaign. He’s second in the league with 53 targets and fifth with 544 air yards. He’s tied for fourth (with a lot of other receivers) with three touchdowns receiving. And he’s top 10 with 29 receptions. But he’s outside of the top 30 with 272 yards receiving, and he has zero targets inside the 10-yard line. Last year, he was top-10 with 10 such targets. It’s hard to say that Brown is having a bad year, but through four games, he’s having a bad year for him. If we exclude players who have appeared in only one game, Antonio is the No. 18 wide receiver with 18.6 points per game in PPR scoring. That’s not horrible — but of any receiver with that many points, Brown is the only one with a negative Plus/Minus. Because of his high salary-based expectations, Brown has little margin for error, and this season he’s been significantly less than his best. Last year, Brown had nine 100-yard performances in 15 games. This year, he’s yet to hit the century milestone. But this could be the week Antonio finally breaks out. The Steelers have a slate-high implied total of 30.5 points, and they are favored at Heinz Field. Like quarterback Ben Roethlisberger, Brown has severe home/road and favorite/underdog splits. Since 2014 (the first of his All-Pro campaigns), Brown has had 29.2 DraftKings points, a +8.01 Plus/Minus and a 70.4% Consistency Rating in 27 games when laying points in Pittsburgh. No receiver with a double-digit sample as a home favorite has anything close to Brown’s massive Plus/Minus edge in that situation. On top of that, the Steelers will once again be without running back Le’Veon Bell (contract dispute). In Bell’s absence, Brown has enjoyed elevated production since Bell’s 2013 rookie year. 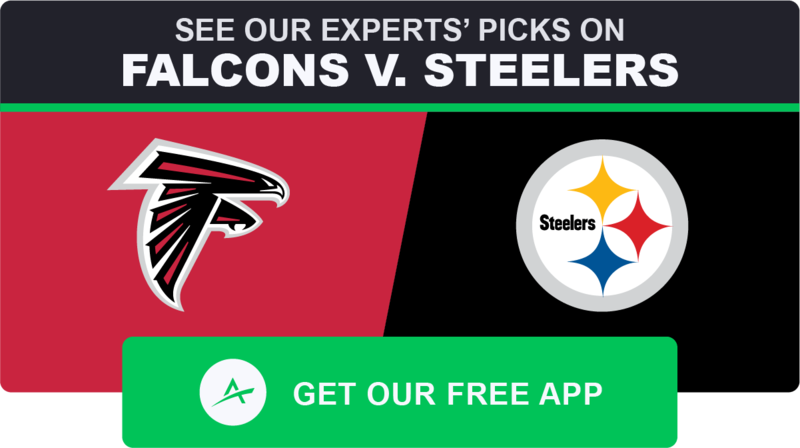 Most importantly, Brown has a great matchup against the Falcons, who are 28th in pass defense with a 22.2% mark in Football Outsiders’ DVOA and have suffered a rash of defensive injuries to open the year: Starting middle linebacker Deion Jones (foot, IR), free safety Keanu Neal (knee, IR), strong safety Ricardo Allen (Achilles, IR) and defensive tackle Grady Jarrett (ankle) are all out. That’s 10 receivers with 8+ DraftKings points in just three weeks. We’re expecting cornerback Robert Alford to shadow Brown for most of the game. The fantasy gawds are good. If Brown doesn’t smash now, he might never smash again. Brown will have a high ownership rate in guaranteed prize pools, but he’s worth rostering since — as our Stack Seeker shows — even chalky players can be rostered together in unique lineups with a couple key differentiating players. When constructing tournament lineups, use our Lineup Builder to stack Brown with Roethlisberger. Since 2014, No. 1 wide receivers on average have had a 0.50 correlation with their quarterbacks. With Big Ben, Brown has had a 0.60 correlation. Brown leads all wide receivers with his median and ceiling projections and has a position-high 98% Bargain Rating on FanDuel, where he is tied for first with eight Pro Trends and is the No. 1 wide receiver in the Bales, Levitan, Koerner, Raybon and SportsGeek Models. No player in NFL history has ever had more than Smith-Schuster’s 1,333 yards receiving before turning 22 years old, not even Randy Moss (1,313). JuJu leads the team with 31 receptions, 416 yards receiving and 191 yards after the catch. A smooth technician with a plus physical profile, Smith-Schuster has run 85.9% of his routes out of the slot this season, where we expect him to face cornerback Marcus Trufant, who normally plays on the outside but was moved to the slot last week as the Falcons reconfigured their injury-impacted secondary. Before the Falcons’ last game, Trufant hadn’t played as the team’s primary slot corner since Week 7 of his 2013 rookie season, and it showed. Although he has a Pro Bowl to his name, Trufant was exploited in coverage, allowing a 9-108-1 receiving line on 11 targets. This season he has the worst Pro Football Focus coverage grade of his career with a 60.6 mark. Brown isn’t the only Steelers wide receiver with vast potential. Smith-Schuster is tied with Brown for first with eight FanDuel Pro Trends. Washington is a talented second-round rookie with 51 snaps per game over the past three weeks, but he trails Brown, Smith-Schuster, tight end Vance McDonald and running back James Conner in target priority. Still, a few wide receivers less talented than Washington have had big games against the Falcons since Week 2. He’s an option as a GPP leverage play. On Sunday morning, I will probably look for action on receiving yardage props for the Steelers wide receivers. To find the best bets in the props market, use our Player Props Tool, which is powered by our industry-leading projections. Since Week 1, the props with a bet quality of 10 have gone 90-45-3, which is good for a 65% win rate. Jones leads the league with 1,946 yards receiving since the start of the 2017 season, but as the #NeverJulio Twitter movement likes to point out, he hasn’t scored a touchdown in his past nine regular-season games. Jones’ touchdown woes are legendary, but since morphing into his top-shelf self in 2014, he’s managed to play as the fantasy WR3, averaging 20.5 DraftKings points despite scoring only 0.35 touchdowns per game. He’s the all-time NFL leader with 96.5 receiving yards per game: Even when he doesn’t score, Jones is good enough to have a top-five week at the position. And in his 19 games with a touchdown since 2014, he’s rocked out with 30.8 PPR points per game. 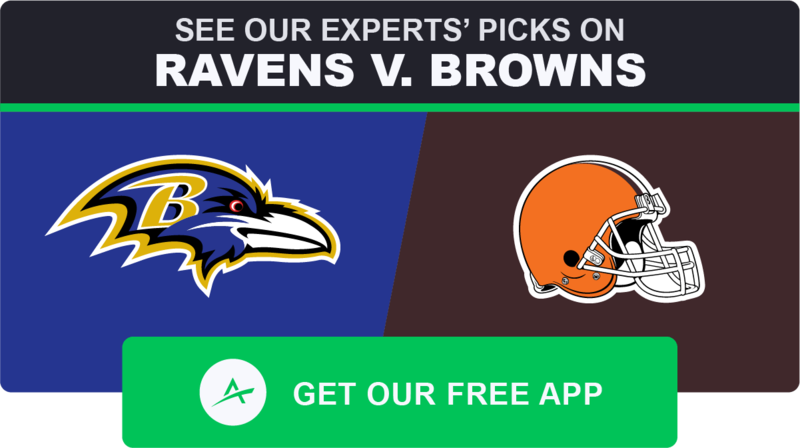 As we highlighted on the Wednesday edition of The Action Network NFL Podcast, Jones is in a great spot against a Steelers pass defense that has allowed a slate-high 49.6 DraftKings points per game to wide receivers. Julio leads the league with a 0.32 market share of targets and outrageous 0.51 market share of air yards. He also has an NFL-best 502 yards receiving and 713 air yards. With his usage and production, Jones has 100-yard, multi-touchdown upside. The Falcons infamously struggled in the red zone last year under offensive coordinator Steve Sarkisian, and that hurt Jones. But they’ve been perfect inside the 20-yard line over the past three weeks, converting all 13 of their trips into points (11 touchdowns and two field goals). If the Falcons have indeed found the cure to their long-lasting red-zone illness, Jones is also likely to get healthy soon. I was so, so wrong about Ridley. (Probably.) Ridley is yet to play even 65% of the offensive snaps in any game, but he has six touchdowns through his first four games. Literally no player in NFL history has scored more in his first month of playing time. Ridley is lining up all over the formation: 79 snaps out wide on the right, 38 on the left, 40 in the slot and even two in the backfield. Although the Falcons are bringing him along slowly, they’re deploying Ridley in strategic, high-leverage ways to maximize his usage. That he leads the team with five red-zone targets is incredibly telling. As for Sanu, even though he has more targets (24 to 21) and receptions (16 to 15) than Ridley, the veteran is the tertiary option in the passing game. But in a high-scoring game, he could still put up points. Over the past two weeks, he has a 10-147-1 receiving line on 16 targets (plus a 2-point conversion), and since last season he has somehow hit salary-based expectations in 63.2% of his games with a +1.94 DraftKings Plus/Minus. Of the three Falcons wide receivers, Sanu will unquestionably have the lowest ownership rate. Besides Brown, there are four wide receivers at the top of the individual Pro Models that Jonathan Bales, Peter Jennings (CSURAM88), Adam Levitan, Sean Koerner, Chris Raybon, Kevin McClelland (SportsGeek) and I have constructed. Adams leads the league with 25 touchdowns receiving and 54 red-zone targets since 2016, and he has one of the league’s best quarterbacks in Aaron Rodgers. With both Geronimo Allison (concussion) and Randall Cobb (hamstring) tentatively expected not to play (more on them later), Adams is ticketed for a massive target share — which explains why he has a position-high floor projection on FanDuel, where he’s the No. 1 wide receiver in the CSURAM88 Model — but this is a tough spot. Adams (calf) suffered an injury on Wednesday, causing him to miss practice on Thursday. Players who suffer mid-week injuries are usually best avoided, and it’s questionable as to whether Adams will even play. Even if he is active, he’s likely to be shadowed by cornerback Darius Slay, who has allowed only seven receptions for 64 yards and a touchdown in his coverage this season. If Adams plays, he will be a strong candidate for double-digit targets. He has averaged 20.0 PPR points in his 14 career games with 10+ targets, but he’ll also be incredibly hard to trust with his recent injury, making him a GPP-only play. It doesn’t help that the Packers and Lions both play at a slow pace, making this game less likely to shoot out. It also doesn’t help that the Lions are exploitable via the running game (league-high 631 yards rushing allowed), because teams are less incentivized to throw against them. The Lions have “held” wide receivers to a league-low 22.1 DraftKings points per game. Allison (concussion) played as the No. 2 receiver last week, seeing a career-high 11 targets — then he suffered a head injury with a little more than a quarter remaining to play. He’s week-to-week and is still in the league’s concussion protocol. He’s yet to practice and is questionable at best for Week 5. It would be surprising if he plays against the Lions. Cobb (hamstring) has already been ruled out and will miss his second game in a row after sustaining an injury in practice last week. In Cobb’s absence, Valdes-Scantling played as the clear No. 3 wide receiver, seeing 71% of the offensive snaps. He had only one reception for 38 yards on three targets, but if Adams, Allison and Cobb all sit in Week 5, then MVS will likely be a popular plug-and-play fill-in given his projected target share and paltry salary. It’s hard to trust a guy with non-2017 Case Keenum as his quarterback, especially when he doesn’t even lead his team in targets. But Sanders does lead the Broncos with 24 receptions, 367 scrimmage yards and 95 yards after the catch. Pretty clearly, Sanders is the best receiver on the Broncos at this point. Although the Jets are second in pass defense with a -18.4% DVOA, Sanders is in an intriguing spot. The Jets have something of a slot-flowing funnel defense in that outside cornerbacks Morris Claiborne and Trumaine Johnson are a respectable duo, but slot corner Buster Skrine is utterly exploitable. Skrine has never been a good cover man, and this year he has a career-worst and team-low 47.8 PFF coverage grade, having allowed a 16-206-1 receiving line on 21 targets — and that’s despite playing only 15 snaps in Week 3. Of any corner to play more than 100 snaps in the slot this season, Skrine has been targeted more than any other, with 5.1 snaps per target. Sanders has played 54.3% of his snaps and run 62.1% of his routes in the slot this year. Sanders has only 11 touchdowns receiving since 2016, but he could find the end zone in Week 5 at what we’re projecting for less than 5% ownership. This game is currently a pick’em, but as Chad Millman and Bob Scucci discuss on the Wednesday edition of The Favorites podcast, the Broncos will probably be favored by game time. Sanders is the highest-rated FanDuel wide receiver in the Freedman Model. I’m a staunch modern-day Demaryius anti-truther. He leads the team with 33 targets, but he has declined from 15.5 yards per reception in 2013 to a career-low 8.4 this year. A low-upside player, Thomas has a tight end-esque 8.6-yard average depth of target (aDOT). Sutton is the future No. 1 receiver and has almost as many routes run (123) as Sanders (140) and Thomas (130). Third on the team with 20 targets, Sutton is first on the Broncos with 322 air yards. At some point, the breakout will come. UPDATE (10/6): Jones (ankle) is questionable. It’s easy to look at Jones and see a guy who is yet to have 10 targets, five receptions or 70 yards in any game this season. He’s third on the Lions with 29 targets and 233 yards receiving and fourth with 15 receptions. He’s fifth with just 59 yards after the catch. The box scores suggest that he’s an afterthought in this offense — but that’s not the case at all. Last year he was first on the team with 1,101 yards receiving and 1,624 air yards. This year, he once again leads the Lions in air yards with 448. He’s still every bit the speedy, big-play specialist he was in 2017. … he’s in a good spot this week. Jones has lined up split out to the left on 47.7% of his snaps this year, where right cornerback Tramon Williams has played 81.9% of his defensive snaps. Williams has been solid throughout his career, but he is now 35 years old, has just a 66.4 PFF coverage grade and lacks the speed (4.59-second 40 time) to keep up with Jones (4.46-second 40). 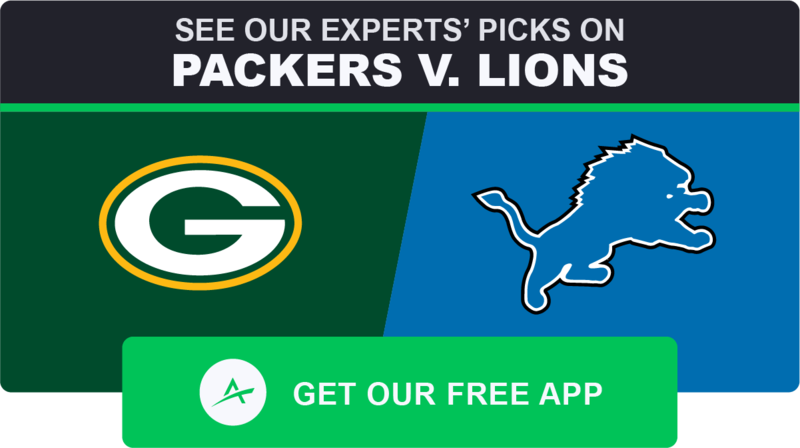 The sample is small, but since joining the Lions in 2016, Jones has abused the divisional rival Packers more than any other team. Jones is utterly too cheap on DraftKings, where he has a position-high 10 Pro Trends and is the highest-rated wide receiver in every Pro Model except for one (Freedman). Running 73.0% of his routes out of the slot, Tate leads the team with 44 targets, 28 receptions, 389 yards receiving, 206 yards after the catch and three touchdowns receiving. Packers first-round rookie cornerback Jaire Alexander has done well this year in the slot with a 76.5 PFF coverage grade, but he was dominated by the Vikings’ veteran wide receivers in Week 2, allowing an 8-71-1 receiving line on nine targets. Tate has the potential to destroy Alexander. Babytron is second on the team in everything with 32 targets, 23 receptions, 330 yards receiving, 435 air yards, 127 yards after the catch and two touchdowns receiving. An emerging playmaker, Golladay has plays of 25+ yards in 9-of-15 career games. Williams is a difficult player to invest in because he’s coming off a rookie season in which he barely played because of a lingering back injury, then just last week he had one reception for 15 scoreless yards. But with apologies to the other talented players on the Chargers, Big Mike might already be the team’s best wide receiver. In his sophomore season, he’s looked every bit like the Clemson star who was drafted No. 7 overall in 2017. Even though he’s third on the team with 18 targets and fourth with 12 receptions, he’s first with 301 air yards and three touchdowns receiving. Of all the pass-catchers targeted this year by quarterback Philip Rivers, Williams has been the most productive with his opportunities, averaging 14.7 adjusted yards per attempt. His 150.5 WR Rating is also the fifth-highest mark in the league (PFF). With 2.80 fantasy points per target, Williams ranks fourth among all wide receivers, and he’s top-five with his +54.8 Production Premium and +73.2% Target Premium (PlayerProfiler). In terms of efficiency, Williams has been one of the unheralded heroes of this young season. The Raiders are 24th in pass defense with an 18.4% DVOA, and we’re projecting Williams to face Gareon Conley most out of the opposing cornerbacks. A 2017 first-rounder like Williams, Conley might have a bright future, but right now he has a 57.5 PFF coverage grade and is allowing 18.9 yards per reception. Williams leads the Chargers with 17.0 yards per catch and is a big-play savant with the size (6-foot-4, 218 pounds) to beat Conley (6-foot, 195 pounds) in any contested-catch scenario. Williams is the No. 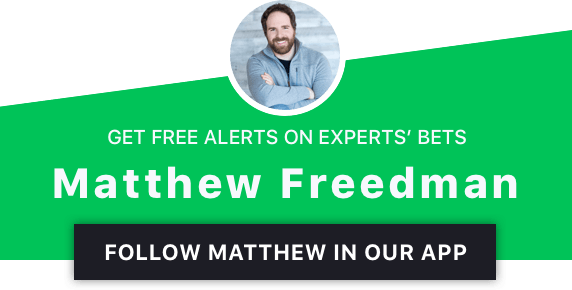 1 DraftKings wide receiver in the Freedman Model. Last year, Allen averaged 9.9 targets and 0.94 targets inside the 10-yard line per game. This year, he’s averaging nine and 0.75. For a player with an uninspiring 7.7 aDOT, any decrease in volume is cause for at least slight concern. The Gazelle has played more snaps (200 vs. 164) and run more routes (130 vs. 109) than the other Williams, but Tyrell has trailed Mike as a producer with a 10-126-1 receiving line. Here’s a quick look at the remaining fantasy-relevant receivers on the slate. OBJ has had a silent season so far with “just” 31-340-0 receiving on 45 targets for 17.8 DraftKings points per game, but he’s still being used in a high-leverage capacity with four red-zone targets and the league’s second-highest market share of air yards at 0.44. The eruption game is on its way. In NFL history, no player has more receptions and receiving yards through 51 career games than Beckham’s 344 and 4,755. Last week, Shepard had a 10-77-1 receiving performance on 10 targets (as well as a 2-point conversion) in his first game without tight end Evan Engram (knee), who is out again this week. Shepard leads the Giants with a 124.6 WR Rating. Thielen leads the league with 56 overall targets and 38 targets and 28 receptions in the slot. He’s liable to abuse second-year slot corner Sidney Jones, who has a 65.9 PFF coverage grade. Diggs has at least 10 targets, 100 yards or a touchdown in every game this year. The Eagles have allowed wide receivers to score the league’s fourth-most DraftKings points per game (48.1). The No. 1 team in The Action Network NFL Power Rankings, the Rams have the league’s best trio of receivers. Through four weeks, Cooks has more scrimmage yards (468) than Sammy Watkins had with the Rams last year in his four best games combined (313). Woods leads the team with 34 targets and 417 air yards while Kupp leads the team with 195 yards after the catch and four receiving touchdowns. Kupp is also top-five in the league with 10 red-zone targets after finishing top-five last year with 23 such targets. With head coach Sean McVay, Rams games have a 13-7 over/under record, and on the road the Rams have hit the over at a 7-2 rate, which is good for a 52.4% return on investment for over bettors (per Bet Labs). The sample is small, but it’s probably not a fluke, given that McVay’s Rams have hit their implied Vegas totals in 15-of-20 games overall. Green has run only 27.1% of his routes from the slot, but four of his five receiving touchdowns have come as the Y receiver. Even though he has 19.7 DraftKings points per game with a +3.43 Plus/Minus, Green might be on the decline at 30 years old: Never through the first four games of the season has Green had fewer yards than he has now with 297. The sample is small, but Boyd — despite lining up in the slot 66.4% of his snaps — has played as the team’s No. 1 receiver this year. He’s first with 36 targets, 26 receptions, 349 yards receiving, 143 yards after the catch and 2.33 yards per route. In a moment of perfect poetry, wide receiver John Ross (groin) pulled a muscle last week on the first truly dynamic play of his NFL career. He’s out for Week 5. In his absence, Boyd might see even more targets than he usually does. UPDATE (10/6): Watkins (hamstring) is officially questionable but on track to play. Hill has 2,197 scrimmage yards and 20 all-purpose touchdowns since stealing the No. 1 job from an injured Jeremy Maclin in Week 10 of the 2016 season. Since last season, Hill has been a top-eight receiver with 18.2 DraftKings points per game. For all the talk of his volatility and unreliability as a potential cash-game play, his 65.6% DraftKings Consistency Rating since 2016 is an elite mark for a receiver with such high salary-adjusted expectations. Watkins (hamstring) exited Week 4 with an injury and has been limited in practice but is tentatively expected to play in Week 5. 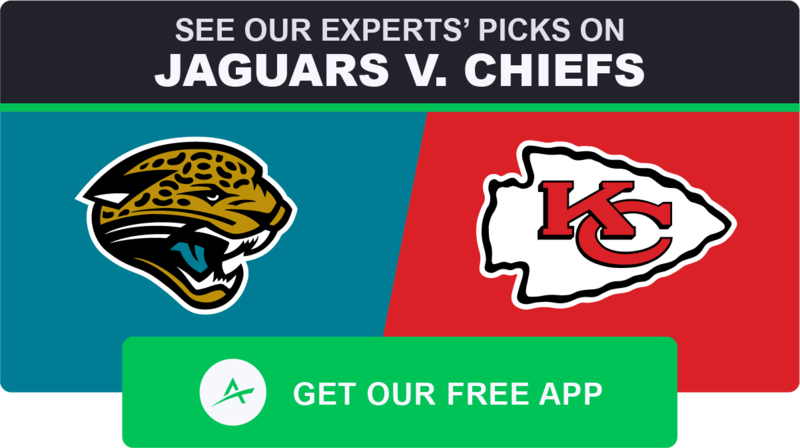 Hill and Watkins have a tough matchup against twin shutdown corners Jalen Ramsey and A.J. Bouye, neither of whom have allowed a touchdown in his coverage this year. Quarterback Baker Mayfield has given 51.6% of his attempts to Landry and Callaway. Landry is fourth among wide receivers with his 47 targets and has a position-high floor projection on DraftKings. Head coach Hue Jackson has said that Callaway might play fewer snaps per game moving forward due to his rookie struggles. Even so, since his insertion into the starting lineup in Week 2, Callaway has led the team with a 0.39 market share of air yards. Hollywood Higgins is the textbook No. 3 wide receiver with 3.3 receptions and 44.5 scoreless yards per game. The matchup is tough, as the Ravens have a slate-high 86.7 PFF coverage grade and are getting back No. 1 cornerback Jimmy Smith (suspension). Davis is on the verge of a breakout: Last week he had the best game of his career with a 9-161-1 receiving performance on 15 targets, and he’s top-five in the league with his 0.32 and 0.42 market shares of targets and air yards. He has more targets (39) and air yards (419) than Taylor and Sharpe have combined (28, 320). But Taylor has potential: The second-year third-rounder had 7-77-0 receiving on nine targets last week in the wake of Rishard Matthews’ release. Sharpe is what Boyd would be if Boyd were less athletic and stuck on a run-first team. Jeffery returned to action last week with a triumphant 8-105-1 performance on nine targets. In his 14 games with quarterback Carson Wentz, the No. 1 receiver has averaged 4.3 receptions for 59.8 yards, 0.64 touchdowns and 14.8 DraftKings points on 8.2 targets. Jeffery is likely to be shadowed by former NFC North nemesis and All-Pro cornerback Xavier Rhodes. Even with the return of Jeffery, Agholor had 12 targets last week, seeing most of his action in the slot. With a team-high 329 air yards but only 168 yards receiving, Agholor is in line for progression, especially if Wentz targets Agholor more to avoid Rhodes’ coverage. A former middle-of-the-field maven for the Eagles, Matthews had a 56-yard touchdown last week, but he’s run only 52 routes (only nine from the slot) in his two games with the team, and he has just five targets. JoBro is in full-blown Renaissance mode: He’s first in the league with 15 targets and six receptions of 20+ yards, second with 243 deep-passing yards and third with 662 air yards. His speed complements quarterback Joe Flacco’s arm strength perfectly. Brown has 17.6 DraftKings points per game with a sparkling +8.37 Plus/Minus and 100% Consistency Rating on just 5.0% ownership. Crabby leads the team with 34 targets, 18 receptions and 169 routes, but his 184 yards receiving suggest that he’s nothing more than a possession receiver at this point in his career. Snead has run 77.1% of his routes from the slot and has an exploitable matchup against cornerback T.J. Carrie, who has a subpar 52.9 PFF coverage grade. Cooper (foot) has been limited in practice this week but is expected to play. The Chargers have allowed 45.6 DraftKings points per game to wide receivers this year, but against shadow cornerback Casey Hayward — who has covered Cooper for the majority of his snaps against the Chargers since 2016 — Cooper has a total of just five receptions for 66 scoreless yards across four games. Since coming alive in Week 3, Jordy has 25.0 DraftKings points per game. This sample is obviously skewed, but it’s worth keeping mind that since his 2011 breakout, Jordy has averaged 17.5 PPR points per game with every starting quarterback he’s played with not named “Brett Hundley.” In Week 3, Nelson had two separate plays of 60+ yards, and he hit more than 20 mph on both of them (per Next Gen Stats). He might not be washed. Last week Bryant had seven targets. He also flat-out butterfingered what should have been a wide-open 53-yard touchdown. The Dolphins have a pitiful 25 pass attempts per game this year, but someone has to be the No. 1 receiver. That’s Stills, who leads the team with 19 targets, 224 yards receiving, 329 air yards, 107 routes, three receiving touchdowns and 89.8% of snaps played. Amendola is locked in as the team’s middle-of-the-field receiver, leading the team with 78 routes and 13 targets in the slot. Wilson has averaged 12.0 DraftKings points per game with a 75% Consistency Rating — and he is being used as an all-around offensive weapon, lining up in the backfield, in the slot and out wide and generating points as a receiver, runner and even passer. Grant (a 2016 Freedman favorite) is a Tyreek Hill-esque talent without an Andy Reid. Grant has run only 52 routes this season, but he leads the team with 2.92 yards and is second in the league with 0.86 fantasy points per route. Parker (quad) missed Week 4 and is questionable for Sunday (and forever). Enunwa has position-high 99% leverage scores on DraftKings and FanDuel and at least eight targets, four receptions and 50 yards in each game this year. Anderson is averaging just four targets per game. Kearse and Pryor are nonentities chained to a rookie quarterback. Funchess has averaged 14.5 PPR points across the 11 games tight end Greg Olsen (foot) has missed since last year. Moore is an upside 21-year-old first-rounder with a team-high 2.57 yards per route thanks to a 51-yard touchdown on four targets and 21 routes. Wright has run 83.8% of his routes from the slot and has a low 5.4 aDOT indicative of high-percentage attempts. Smith is second on the team with 98 routes, but he’s tied for fourth (with a backup rookie tight end) with just seven receptions. Baldwin (knee) returned to action last week and immediately led the team with seven targets and five receptions. Playing 65.6% of his snaps in the slot, Baldwin will likely avoid outside cornerback Marcus Peters for most of the game. Lockett has 50+ yards in each game this year and has emerged as a viable playmaker, although his target share will likely shrink with Baldwin’s return. He has a position-high 98% DraftKings Bargain Rating. Marshall is second on the team with 21 targets and 10 receptions, but last week he played a season-low 36.4% of snaps, ceding playing time to small-school second-year seventh-rounder David Moore, who hit career highs with 65.2% of snaps played and 21 routes run. Moore has a high-upside physical profile (6-foot-1, 219 pounds, 4.42-second 40 time) and at East Oklahoma he averaged 1,024.5 yards and 12 touchdowns from scrimmage in his two final seasons. In Week 4, he turned his two targets into 39 yards. Also, for what it’s worth, this is an all-important #RevengeGame for offensive coordinator Brian Schottenheimer, one of the least pass-friendly play-callers in the league. Cole has averaged 15.8 DraftKings points since emerging as the No. 1 receiver in Week 13 of the 2017 season. Westbrook has run 87.9% of his routes from the slot and leads the team with 28 targets, 21 receptions, 294 yards receiving and 172 yards after the catch. He has an exploitable matchup against slot cornerback Kendall Fuller, who had a 91.2 PFF coverage grade last year but has allowed a disgraceful 17-178-1 receiving line on 25 targets this season. Moncrief leads the team with 296 air yards and has averaged 17.7 PPR points in his two games this year with a touchdown. The Chiefs are dead last in the league with a 41.3 PFF coverage grade. Fitzgerald (hamstring) is dealing with a lingering injury, but he’s fully expected to play. In rookie quarterback Josh Rosen’s first start last week, Fitz had a team-high 78 air yards but is yet to hit even 30 yards in a game since exiting Week 2 early with his injury. Since Fitz’s injury, Kirk has led the team with 20 targets, 15 receptions, 145 yards receiving and 68 yards after the catch. Williams somehow has just two receptions on 13 targets: One of those receptions happened to be Rosen’s first NFL touchdown. Goodwin (quad) is a game-time decision after re-injuring his leg in Week 4. Since last year, he’s averaged 7.8 PPR points per game without quarterback Jimmy Garoppolo (knee). With Dante Pettis (knee) already ruled out and Goodwin uncertain, Garcon could see extra targets. But in his four games with backup quarterback C.J. Beathard, Garcon has averaged 8.3 PPR points. Taylor is a would-be Julian Edelman without a Tom Brady. Jones somehow leads the Bills with 10 receptions and 144 scoreless yards. Benjamin leads the team with 21 targets and 376 air yards, but he’s yet to have even 35 yards receiving in any game. I wouldn’t touch either of these guys with a hazmat suit. Be sure to read the other Week 5 positional breakdowns.